"Jihadi John"-Mohammed Emwazi: Identity of ISIS killer responsible for beheadings revealed. 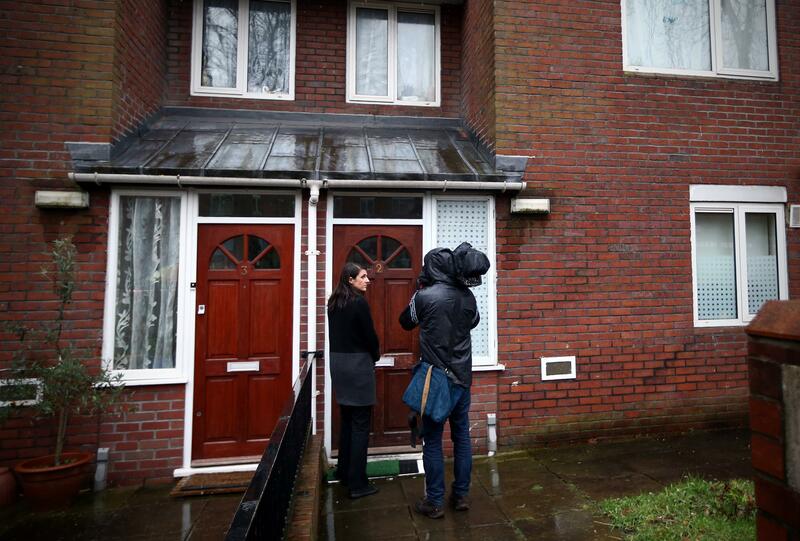 Journalists attempt to speak with residents of the home where Islamic State militant Mohammed Emwazi, who has come to be known as Jihadi John, is believed to have once lived, on Feb. 26, 2015, in London. The paper discovered Emwazi’s identity from his friends and others familiar with his case. The New York Times later confirmed the report with an unnamed “senior British security official,” who told the paper that the British government had known Emwazi was the man behind the black balaclava for some time but had kept his name a secret for operational reasons. British and American officials, meanwhile, have refused to confirm the news on the record. Emwazi and his friends were allowed to return to Britain. … Shortly afterward, Emwazi decided to move to his birthplace, Kuwait, where he landed a job working for a computer company, according to the e-mails he wrote to Qureshi. He came back to London twice, the second time to finalize his wedding plans to a woman in Kuwait. In June 2010, however, counterterrorism officials in Britain detained him again — this time fingerprinting him and searching his belongings. When he tried to fly back to Kuwait the next day, he was prevented from doing so. Eventually he made his way to Syria (exactly when or how remains unknown). In August of this year, he was featured in an ISIS video that appeared to show him beheading American journalist James Foley. What is believed to be the same balaclava-clad man with a British accent was then seen in a string of beheading videos that followed—those of American journalist Steven Sotloff, British aid worker David Cawthorne Haines, British taxi driver Alan Henning, and American aid worker Peter Kassig. Just last month the militant was seen in a video with two Japanese hostages, Haruna Yukawa and Kenji Goto, before they were killed. For more on Emwazi, check out the Post and Times reports.